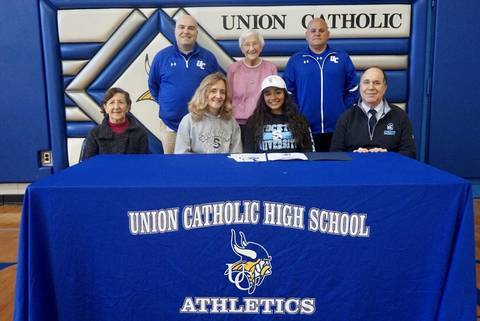 SCOTCH PLAINS, N.J. — Union Catholic soccer star Coral Briber gathered with family, friends, coaches and school administrators to sign her National Letter of Intent with Stockton University during a special ceremony in the gymnasium on Tuesday morning. With several key goal scorers having graduated last spring, the UC soccer team needed someone to step up and fill that void and generate instant offense. Briber more than up to that challenge last fall as she delivered the best season of her career last fall as she blossomed into one of the most dangerous goal scorers in Union County. Combining her pure speed, exceptional field vision and sensational striking ability, Briber erupted for a team-high 16 goals, including two games where she scored hat tricks. Briber was rewarded for her sensational season by being chosen to the Union County Conference All Mountain Division All-Star Team. Briber is exciting about her future.